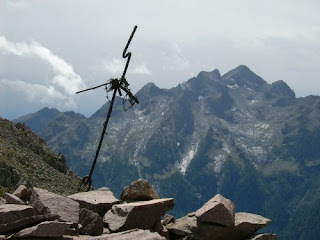 GOOGLE MAPS STARTING POINT: Rifugio Refavaie – Caoria – Canal S. Bovo. If you want to discover a less touristic side of Dolomites region, you should venture into the mountain range of the Lagorai, along which ran the front line between Italy and Austria during the First World War. We suggest you as first destination in the region the fascinating morainic barrier of Monte Cauriol, starting from Rifugio Refavaie, in the Vanoi Valley. This small refuge in the forest is the last place, where you can get refreshment. It may be therefore easier to plan a picnic on the top – a supermarket is available also in the near hamlet of Caoria – and take a rest at the refuge on the way home. The walk up to the Cauriol is quite long (7 hours for the whole tour), but it is not overly demanding, since the path is mainly wide and well-marked. It requires anyway a good physical shape and endurance and trekking equipment. You can park beside the Refavaie refuge (m1116), where the forest road soon enters the trees, along the river Vanoi, and turns then slightly right. About 100m after the first bend, take the path (n.320). Here begins a fairly steep climb into the wood (Bosco Laghetti), which joins up with another forest road. Take it, turning on the left, and walk among the upper meadows of Malga Laghetti, until the path (still n.320) turns away from the road and starts climbing up to Sadole Pass (m2066). From here follow the “Italian Way” on the right. The Old Italian military route runs over black rocks and takes you to Busa della Neve and to Selletta Carteri (m2343), a small saddleback, separating the two capes of Cauriol (the little and the big Cauriol – Piccolo e Grande Cauriol). After few easy climbing passages, you can reach finally the summit (2494m) of Grande Cauriol, with its metal cross, and can enjoy a magnificent landscape, which pays off the 4 hours walk. The 360-degree panorama (breathtaking when the sky is clear!) shows the views from Fassa Valley towards Latemar, Catinaccio, Sassolungo, Marmolada, Pale di San Martino and Cima d’Asta. You can descend on the ascent path. Alternative would be the way back through the “Austrian Way”, which departs from Selletta Carteri and runs along trenches and fortifications of the Austrian Army, turns around the Piccolo Cauriol and reaches the Sadole Pass. A third option is an unnumbered path which starts short after the summit of the big Cauriol (there’s a sign indicating “Malga Laghetti”) and takes you to the rests of an Italian trench of the WWI till the ruins of an old village built up by the Alpine Troupes. This last trail however could be difficult to recognize among the trees. As you reach Malga Laghetti, follow the forest road which runs down to Rifugio Refavaie. If you have time and still want to discover something about the WWI in Lagorai you can visit the local museum in the near hamlet of Caoria (please contact the local group of Alpini to agree a visit or check the opening time at this email).